Ingredients:- 2 lbs. of beef or veal (these can be omitted), any kind of white fish trimmings, of fish which are to be dressed for table, 2 onions, the rind of 1/2 a lemon, a bunch of sweet herbs, 2 carrots, 2 quarts of water. Mode:- Cut up the fish, and put it, with the other ingredients, into the water. Simmer for 2 hours; skim the liquor carefully, and strain it. When a richer stock is wanted, fry the vegetables and fish before adding the water. Note. 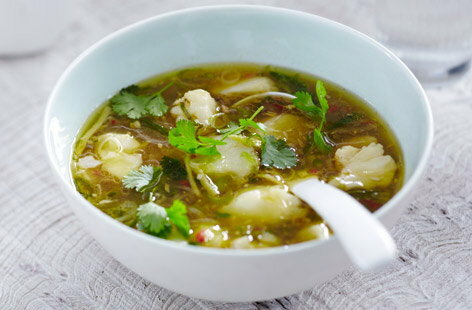 Do not make fish stock long before it is wanted, as it soon turns sour. Ingredients:- 50 crayfish, 1/4 lb. of butter, 6 anchovies, the crumb of 1 French roll, a little lobster-spawn, seasoning to taste, 2 quarts of medium stock or fish stock. Mode:- Shell the crayfish, and put the fish between two plates until they are wanted; pound the shells in a mortar, with the butter and anchovies; when well beaten, add a pint of stock, and simmer for 3/4 of an hour. Strain it through a hair sieve, put the remainder of the stock to it, with the crumb of the rolls; give it one boil, and rub it through a tammy, with the lobster-spawn. Put in the fish, but do not let the soup boil, after it has been rubbed through the tammy. If necessary, add seasoning. Ingredients:- 3 lbs. of eels, 1 onion, 2 oz. of butter, 3 blades of mace, 1 bunch of sweet herbs, 1/4 oz. of peppercorns, salt to taste, 2 tablespoonfuls of flour, 1/4 pint of cream, 2 quarts of water. Mode:- Wash the eels, cut them into thin slices, and put them in the stewpan with the butter; let them simmer for a few minutes, then pour the water to them, and add the onion, cut in thin slices, the herbs, mace, and seasoning. Simmer till the eels are tender, but do not break the fish. Take them out carefully, mix the flour smoothly to a batter with the cream, bring it to a boil, pour over the eels, and serve. Time. 1 hour, or rather more. Note. This soup may be flavoured differently by omitting the cream, and adding a little ketchup. Ingredients. 3 large lobsters, or 6 small ones; the crumb of a French roll, 2 anchovies, 1 onion, 1 small bunch of sweet herbs, 1 strip of lemon-peel, 2 oz. of butter, a little nutmeg, 1 teaspoonful of flour, 1 pint of cream, 1 pint of milk; forcemeat balls, mace, salt and pepper to taste, bread crumbs, 1 egg, 2 quarts of water. Mode:- Pick the meat from the lobsters, and beat the fins, chine, and small claws in a mortar, previously taking away the brown fin and the bag in the head. Put it in a stewpan, with the crumb of the roll, anchovies, onions, herbs, lemon-peel, and the water; simmer gently till all the goodness is extracted, and strain it off. Pound the spawn in a mortar, with the butter, nutmeg, and flour, and mix with it the cream and milk. Give one boil up, at the same time adding the tails cut in pieces. Make the forcemeat balls with the remainder of the lobster, seasoned with mace, pepper, and salt, adding a little flour, and a few bread crumbs; moisten them with the egg, heat them in the soup, and serve. Time. 2 hours, or rather more. Ingredients:- 6 dozen of oysters, 2 quarts of white stock, 1/2 pint of cream, 2 oz. of butter, 1-1/2 oz. of flour; salt, cayenne, and mace to taste. Mode:- Scald the oysters in their own liquor; take them out, beard them, and put them in a tureen. Take a pint of the stock, put in the beards and the liquor, which must be carefully strained, and simmer for 1/2 an hour. Take it off the fire, strain it again, and add the remainder of the stock with the seasoning and mace. Bring it to a boil, add the thickening of butter and flour, simmer for 5 minutes, stir in the boiling cream, pour it over the oysters, and serve. Note. This soup can be made less rich by using milk instead of cream, and thickening with arrowroot instead of butter and flour. Ingredients:- 2 quarts of good mutton broth, 6 dozen oysters, 2 oz. butter, 1 oz. of flour. Mode:- Beard the oysters, and scald them in their own liquor; then add it, well strained, to the broth; thicken with the butter and flour, and simmer for 1/4 of an hour. Put in the oysters, stir well, but do not let it boil, and serve very hot. Ingredients:- 2 quarts of fish stock or water, 2 pints of prawns, the crumbs of a French roll, anchovy sauce or mushroom ketchup to taste, 1 blade of mace, 1 pint of vinegar, a little lemon-juice. Mode:- Pick out the tails of the prawns, put the bodies in a stewpan with 1 blade of mace, 1/2 pint of vinegar, and the same quantity of water; stew them for 1/4 hour, and strain off the liquor. Put the fish stock or water into a stewpan; add the strained liquor, pound the prawns with the crumb of a roll moistened with a little of the soup, rub them through a tammy, and mix them by degrees with the soup; add ketchup or anchovy sauce to taste, with a little lemon-juice. When it is well cooked, put in a few picked prawns; let them get thoroughly hot, and serve. If not thick enough, put in a little butter and flour.